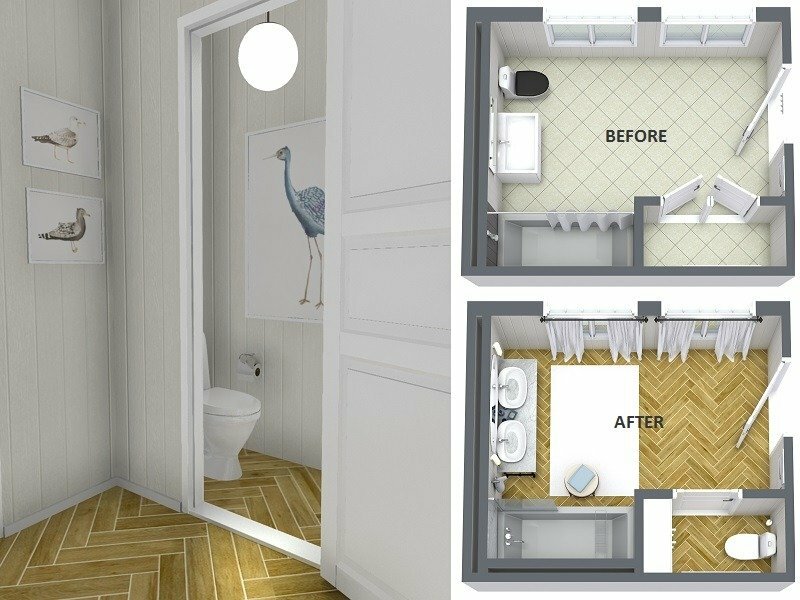 With RoomSketcher it’s easy to plan and visualize your bathroom ideas. Create your floor plan, furnish and decorate, then visualize in 3D, all online! 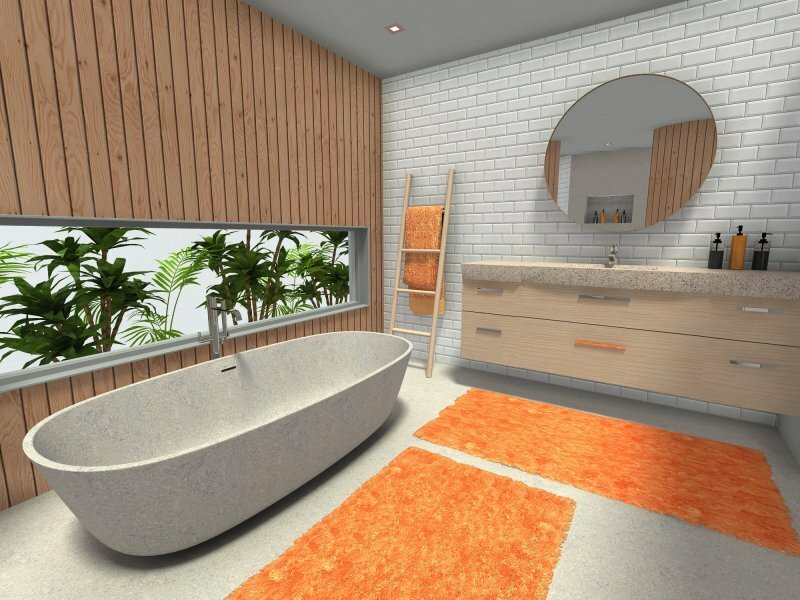 Looking for some bathroom ideas to help you update your bathroom, give it a fresh new look or even to plan a bathroom remodel? Below you’ll find some of our favorite bathroom ideas. We’ll show you how to work with finishes, different fixtures options, how to save space and easy ways to update your bathroom decor. Adding an accent tile is a great way to update a bathroom. Choose one wall to be the focal point for your room. For bathrooms, the back wall tends to be the best. Add a colored mosaic or patterned tile. 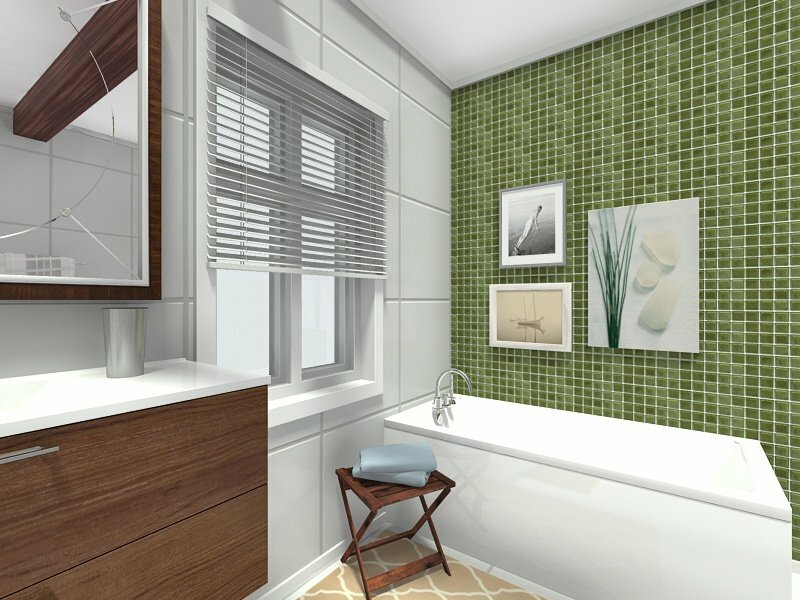 In this room, we used a green mosaic tile to evoke nature and to complement the wood finish on the vanity. Add a centerpiece to your bathroom with a fabulous freestanding tub. They are a bathroom upgrade that adds value to your home and a sense luxury to the room. Clawfoot tubs are no longer the only option. 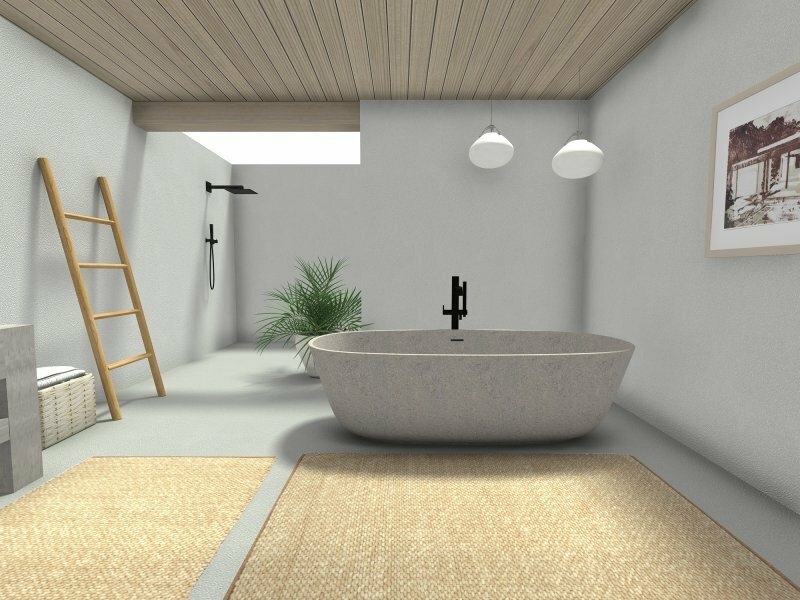 The new freestanding tub designs are sculptural, modern and fluid looking – the perfect centerpiece for any bathroom design. Add a mirror across a whole wall to double the look and feel of your bathroom. This is a great technique to make small or narrow bathrooms feel larger. Locate the mirror either above the vanity or along one side wall. Mirror walls are also great for reflecting light, so you get more light from your light fixtures and windows. Try a dark wall color to create an intimate and inviting feeling in a bathroom. When you use a dark wall color in a bathroom keep the ceiling finish light or you’ll make the room feel smaller. 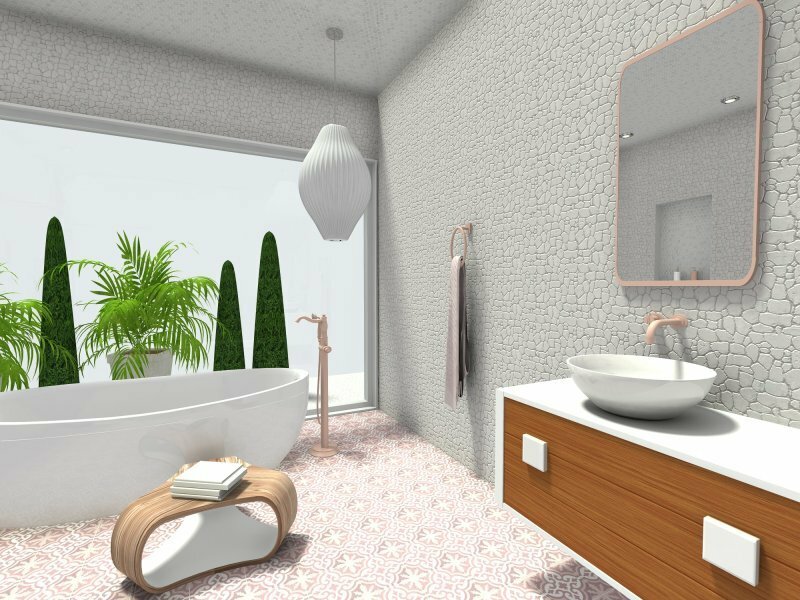 This bathroom has a patterned tile above the tub and a dark lavender-grey wall color that matches the background of the accent tile. The dark wall color highlights the accent wall and make it the focal point of the room. A water closet is a welcome addition in any bathroom. It adds privacy and makes it possible for more than one person to use the room. The water closet in this bathroom design was created from an oversized linen closet. It’s a better use of the space and doubles the capacity of the room. Bathrooms are a great place to have fun with flooring because they are not too large. Try patterned tiles, mosaics, penny tiles, or beautiful stone or marble tiles. This bathroom has a fun black and white checkerboard tile place on an angle to add a dynamic effect. When you use pattern on a bathroom floor keep your wall finishes simple. This allows the floor to be the star of your design. 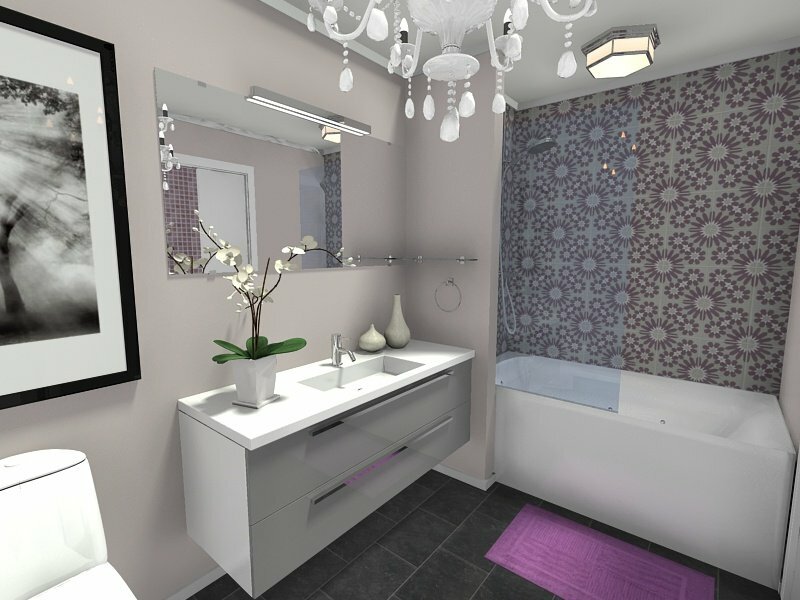 Update a bathroom easily with colorful bathroom decor. A red framed mirror inspired the color scheme for this bathroom design. When you accessorize with color in a bathroom, stick to one color to create a color theme. If you want to include some pattern, restrict it to one item such as a shower curtain, to create a focal point and to keep the design from looking too busy. These bathroom ideas were created with RoomSketcher. 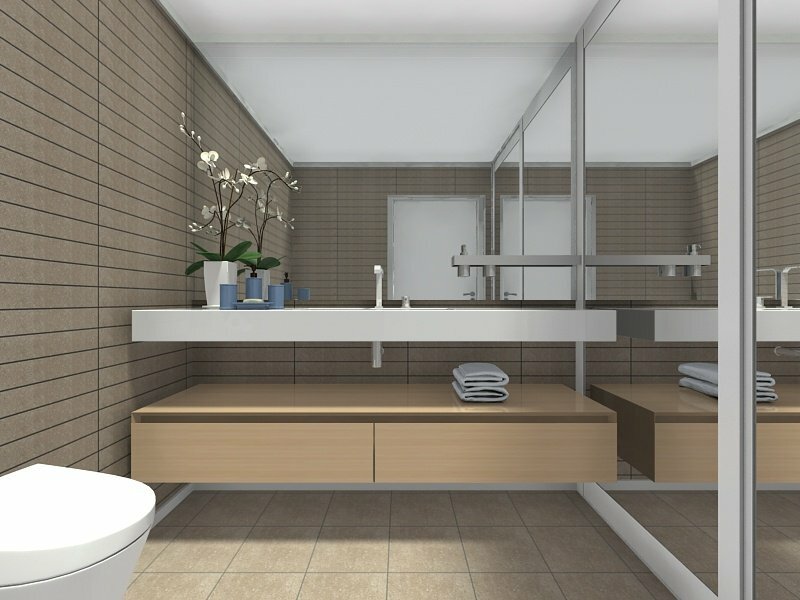 You can use this easy-to-use online bathroom planner to plan and visualize your own bathroom ideas!